What: Applying permanent thrust load to the bearing so that it is securely installed and has no axial clearance. Why: The bearing preload process eliminates unwanted clearances, creates high stiffness, and reduces noise and vibration which increases bearing and application life. How: Rotor Clip offers three different solutions to pre-load bearings and eliminate axial clearance. Overhead assembly possible, since the wave spring can lightly grip the inside of the bearing bore. Can be installed automatically via a tapered mandrel similar to the automatic installation of retaining rings. Even load / force with small tolerances due to even, sinusoidal waves in the spring design. No radial jamming, since spring ends are able to overlap and do not push against one another. No tooling cost for special sizes. The design of standard single turn wave springs with gap features sharp corners at the cut off area of the spring ends. But the sharp corners can scratch the surface of the bearing as well as the mating parts when the wave form shows a steep incline depending on the load specification. This debris can lead to failure of the bearing as well as the entire application. 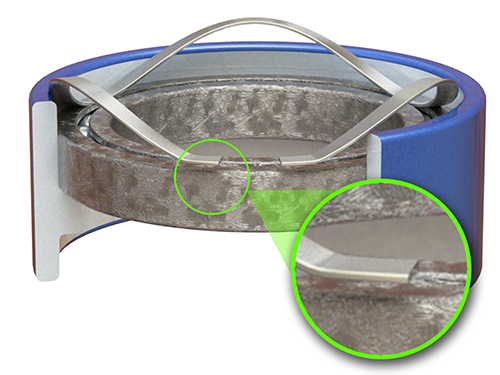 Rotor Clip's patentend design solves this problem by flattening the ends of the spring so that they will not create excessive wear that can damage the application. Compensating for accumulated tolerances is what "Bowed" retaining rings are designed to do on a shaft or in a housing. Once snapped into the groove, bowed rings exert a force or a "preload" on the retained parts for the range specified in the catalog. These rings have a 15° angle on the outer edge. Combined with a complementary groove angle to eliminate endplay by wedging itself between the groove and the retained part.